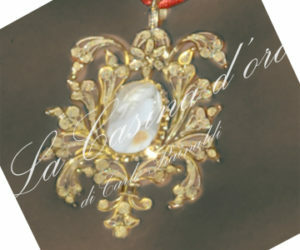 The tradition of a precious and patient technique of filigree workmanship, allows the creation of very light handworks, using gold and silver. Woven strands in various thicknesses, elegantly arranged around a stronger frame, are shaped with floral patterns, or filiform spirals, and give life to a refined and endless production of traditional jewels like the “Berlocche”, a double-faced pendant, and also many other objects, like earrings, rings, necklaces which faithfully reproduce ancient shapes. But the realization’s talent doesn’t end with jewelry production, which anyway is talking about Pescocostanzo goldsmith traditions, but it goes ahead looking at a renewed research project, to evolve new models through jewelry design’s study, that represents the right transition from “tradition to innovation”.